The bane of music reviewers are albums that astound us but that defy easy characterization or specific analysis due to their width and breadth or avoidance of specific genre classification. 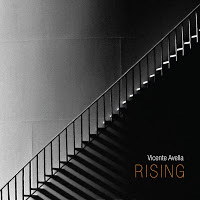 It's frustrating - the easy way out is to state simply "this is an amazing album and you should buy it right now," which I could apply to Vicente Avella's Rising for sure. However, I am aware that even with my reputation as a music reviewer of 20+ years that is not enough. So, I will do my best to capture in words why I am so damned impressed with this recording. Working with the Eclipse String Quartet, as well as a bassist (Tom Peters), a percussionist (Brad Dutz), a guitarist (Jim Lum), and four vocalists (Kelci Hahn, Audra Nakane, Cindy Torroba, and Kristin Soni), Avella has produced a work that features not just an array of instrumental music genres, but all of it done with an astounding level of proficiency from both the artist himself (on piano) as well as his passel of guest artists. I asked the artist via email if he did the charts (arrangements) for the string quartet and he said yes, he did it all – composing, arranging, conductor, et al. Frankly, I am awed. The quartet sounds fantastic no matter what the style, mood, tempo or whatever of any specific song. Some credit obviously goes to the recording engineers (Matthew Snyder and Michael Seberich) and mastering engineers (Serberich again as well as Dave Glasser), but technical wizardry in the service of mediocre music, while sounding great, is still just "meh." Rising is anything but "meh." The album is full of music with true emotional depth, dramatic power, and a sense of conviction and commitment by the performance that left me breathless at times. In trying to describe the music itself, it would be simplistic to state it is neo-classical, owing to the presence of the Eclipse Quartet, although some tracks do hew closely to classical roots. However, other songs broaden into orchestral pop (thanks in part to Avella also wielding samples and loops to give some songs a much fuller sound), jazz, cinematic soundscapes, and even a hint of rock. Yet, there is undeniable cohesion here, helped by the presence of the quartet on songs even when the compositions are not rooted in the classical genre. The gentle opening number, "Yours," flows with a distinctly soft romanticism, and Avella's piano is paired perfectly with the quartet, blending elegance with simplicity and nary a trace of pretension – a fantastic beginning. "For Always," ups the tempo/energy and Avella's piano playing at the forefront shines a light brightly on his talent at both technical artistry and control of nuance. The song gathers steam and drama as the string quartet joins later in the piece, but the real fireworks come at the midpoint of the nearly 9-minute track, with piano and strings erupting in a flurry of passion. The title track, next up, switches the mood to somber and even somewhat sorrowful at the outset, as the piano melody features minor key refrains that mimic the image of someone ascending the daunting, and high, staircase which graces the album's cover. Later, the quartet joins the piano, the players bowing their instruments in short strokes, giving an even more dramatic emphasis to the music. This piece really grabs me. Part of this track reminds me of the The Kronos Quartet's work on Clint Mansell's soundtrack to The Fountain. An abrupt (but pleasantly so) change of direction appears on "Daybreak," the first foray into music that approaches the accessibility of orchestral pop more than that classical. Avella's playing here is cheerful and the counterpoint of the strings' accompaniment turns the track into something special, with subtle hints of Appalachian influence (to my ears) as well a smattering of jazz (on the piano). Drama is dialed up to 11 (on a scale of 1 to 10) on "Relentless" (by the way, spot on titles for each track, too), a piece that again finds a way of capturing its titular reference with music that has an intensity and power that's palpable from start to finish. Superb string charts on this song (listen on headphones and you will hear what I'm referring to). "Everything" is another gem, an energetic uptempo and upbeat slice of orchestral pop with a grin-inducing melody and infectious rhythm accompaniment, perfect for cruising down the highway. A subtle misstep on the album occurs on "I'm OK," with the introduction of chill-out beats and, later in the track, the brief inclusion of electric guitar power chords, yet the good-natured sound of the song is hard to resist, and the strings have a whimsical aspect which is actually charming.